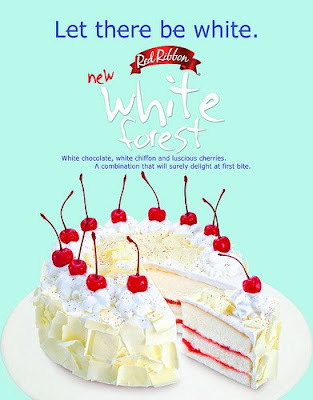 Red Ribbon continues to bring joy to its customers as it launched White Forest, a delectable dessert that will surely make the dining experience an unforgettable one. Bloggers were gathered to the sweet launch held at Red Ribbon Libis branch in Quezon City on 17 September 2009. The name "White Forest" may sound very familiar to cake-lovers like me because it has derived its idea from the already famous Black Forest cake. Red Ribbon, the leader and innovator in cakes, has made another signature product that everyone will definitely crave for. The Red Ribbon White Forest is made of creamy white chocolate and light, moist white chiffon cake layered with real cherry bits filling and a fusion of cream and white chocolate flakes. To make it more delicious to our senses, the cake is gloriously crowned with beautiful cream rosettes with luscious long-stemmed, red maraschino cherries on top. The sight of it is heavenly mouth-watering. Imagine the luscious Black Forest just turned into white! 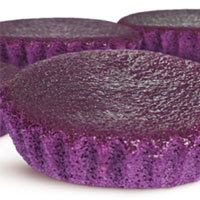 Another new product of Red Ribbon that gratifies our taste buds is Ube Mamon. The Mamon of Red Ribbon is one of my favorite bread products because of its chiffon that is very soft and scrumptious. The taste of Ube Mamon makes a perfect blend of its flavorful ube and buttery soft chiffon that delights sweet-tooth person like me. Take your first bite now of White Forest & Ube Mamon! The experience will never be the same again. Visit any Red Ribbon branch now and check out the other new products they offer in their menu. You may call 8-7777 (Philippine local call) and have your White Forest delivered at your doorstep. The ube mamon sounds more interesting for me. Getting rid of the chocolate in any dessert borders on the insane for me.